The Trump administration formally announced on Monday that it is designating Iran's Revolutionary Guard Corps, or IRGC—the regime's paramilitary fighting force—as a terrorist entity, the first such designation by the United States against a foreign country's military, according to U.S. officials. Iran has already vowed to take punitive actions against the United States as a result of the designation, which could cripple many key sectors of the Iranian economy due to the IRGC’s involvement in a range of Tehran’s business ventures. In making the decision to designate the IRGC, which has been rumored for some time, the White House considered the fighting force’s near total penetration of Iran’s society and economy. Any international government or business that is caught dealing with Iranian interests connected to the IRGC could face new sanctions. "The regime provides funding to a number of terrorist groups, including Hezbollah, Hamas, Palestinian Islamic Jihad, Kata’ib Hizballah, al-Ashtar Brigades, and others," the White House said. "These sanctions help cut off revenues the regime uses to fund terrorism, promote global instability, fund nuclear and ballistic missile programs, and enrich its leaders." Congressional critics of Iran were quick to celebrate the administration’s decision. "I applaud President Trump and his administration for taking the long overdue step of designating Iran's Islamic Revolutionary Guard Corps (IRGC) as a Foreign Terrorist Organization," Sen. Ted Cruz (R., Texas) said in a statement. "I have called on subsequent administrations to acknowledge this basic fact, and in 2015 and 2017 I introduced legislation that would have written it into U.S. code." 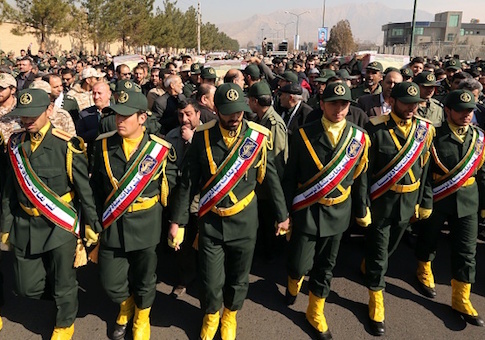 "The IRGC's elite Quds Force was previously designated, but this did not dissuade Iran from using its funding, weapons, and personnel to engage in deadly violence around the world," McCaul said in a statement. "As we learned last week, Iran was responsible for the deaths of over 600 U.S. service members during the Iraq War." This entry was posted in National Security and tagged Iran, Trump Administration. Bookmark the permalink.